Very cold (32-39°F): Any beer you don’t actually want to taste. Knowing this, I decided to test out what changes you could expect at various temperatures. I went with Rivertown’s Helles because I’m very familiar with this beer and lagers don’t hide flaws as well as say an IPA. I then subjected the bottles to the situations below and took a temperature reading at the time of my first pour. Standard serving style taking a nicely chilled beer from the fridge and pouring it into a room temperature glass. – Serving Temp 45°F – I figure this is the most common way people will drink most of their beer, and it tastes just like it should with no strange effects to the beer. Got home from the store but forgot to put the beer in the fridge for a few hours and can’t wait? Here’s what to expect! – Serving temp 79°F – Brighter more golden color compared to the previous yellow. Much more grain in the aroma than before as well as increased fruity esters. Significantly more bitterness and almost no sweetness left, clove and banana fruit esters are coming out, and lots of grain. The body hasn’t changed much, but carbonation took a big leap up. Now to make it worse, so you don’t have to. The high today was 93°F, so I left this brew setting on the back patio. The potential for becoming light struck existed but luckily didn’t occur here. Perhaps you had a party yesterday, and this straggler got left out, and you got curious? – Serving Temp 99°F – Slightly darker color than the others with loads of head during the pour but it only lasted a few milliseconds at best. The room temp glass quickly became warm to the touch. Grainy flavor and I can feel some heat on my nose. Uck wow, that is putrid. Extremely bitter blowing away most IPAs, very highly carbonated, no real flavor other than the bitterness. Still, a super light body but there is a slick slightly burning mouth feel, and I’m throwing the rest of this out. Finally on the opposite end of the spectrum. Pulled from the fridge and poured into a shaker pint fresh from the freezer to replicate all those beer commercials on TV – Serving temp 40°F – I’m a bit disappointed in the lack of change between this and standard refrigerator temp poured into a room temp glass. I thought the frozen glass would have more than a 5-degree impact. So it looks like TV commercials and bars aren’t all horrible for doing this as it makes a slight difference. 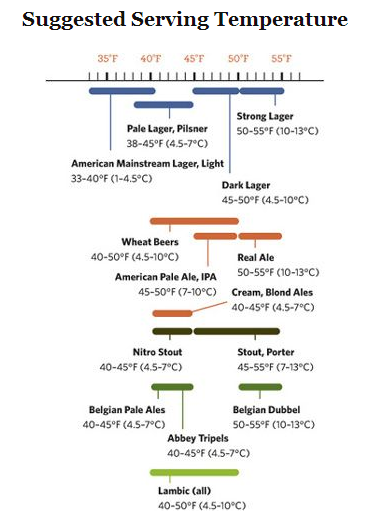 Update: Ryan from Mould’s Beer Blog reminded me that Randy Mosher wrote about this in his incredible book Tasting Beer (My review here, buy your copy here) this is the picture he used to display the temperature range for different styles. In my opinion the biggest issue with the frozen glass is it kills the head, which in turn, kills the aroma, which really affects the flavor. Boo ice cold glass. Agreed, and I’d add that it changes the mouthfeel a bit as well. Nice article. I like the idea. Looking at the ratebeer chart though I can’t agree with some of their recommendations. I prefer to pull a lambic from the cellar and chill for a bit – I much prefer them starting chilled them warming a touch if needed. I guess that’s mostly because I take awhile to drink them and don’t want them to be warm. IPAs should also start chilled. DIPA/ Imperial IPA can start off a touch warmer, but shouldn’t be served as warm as a stout. I pull stouts out and open them at cellar temperature, but I tend to chill all of my beers and then allow them to warm slightly. It’s hard (read time consuming) to chill a beer back down, but easy to warm it up if it’s too cold so I always start low and raise the temp until I’m happy. That said, I get annoyed when bars (esp better beer bars) serve their beer at freezer temps. ); I don’t want to get frostbite trying to warm my beer. I’m with you. I don’t have a special beer fridge so most of my beers start at 40 degrees or cellar temp and warm from there. It’s also nice to enjoy the changes as things warm up, especially with stouts when they start to unleash some rich dark chocolate half-way through the glass. I agree with 100% of this. I was surprised about the lambic and IPA temperatures. I use a frozen mug not to make the beer colder, but to keep it cold/cool longer. 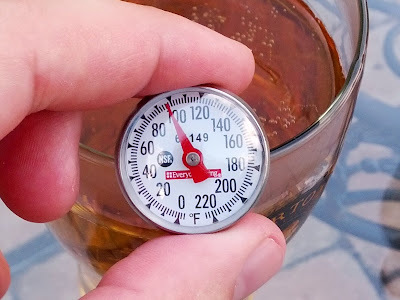 There is a great chart in Randy Mosher’s “Tasting Beer” about proper serving temps. It’s on page 98 if you have the book. If not, I can take a picture of it and send it to you if you’re interested! Great idea doing those temperature experiments! Fun stuff.